Prior Park is a beautiful and intimate 18th-century landscape garden in Bath. It was created to stimulate the senses and is set in a sweeping valley with views out over the city. Local entrepreneur Ralph Allen, with advice from ‘Capability’ Brown and the poet Alexander Pope, created an idyllic landscape filled with temples, a grotto, lakes and the iconic Palladian bridge. The National Trust has been in ownership of the garden for nearly 25 years. Ongoing work aims to restore the garden to its 1764 appearance at the time of Ralph Allen’s death. Extensive works were undertaken in the discrete corner of the garden called the ‘Wilderness’ where a Serpentine Lake, Cascade and Cabinet have been reinstated. It is here that we are introducing a Silent Space. The site of the elaborately carved Gothic Temple can be clearly seen on the ground. It was one of the last garden structures in the Wilderness to be built. In the 20th century, the temple was sold and moved, stone by stone, to a private garden about a mile from Prior Park. Its original location in the garden was chosen by Ralph Allen for its wonderful elevation. This space is now a perfect sanctuary overlooking a lush green valley with reflective lakes below. During 2019 there will be an exciting project taking place at Prior Park as crucial restoration work is carried out on its 18th century dams. 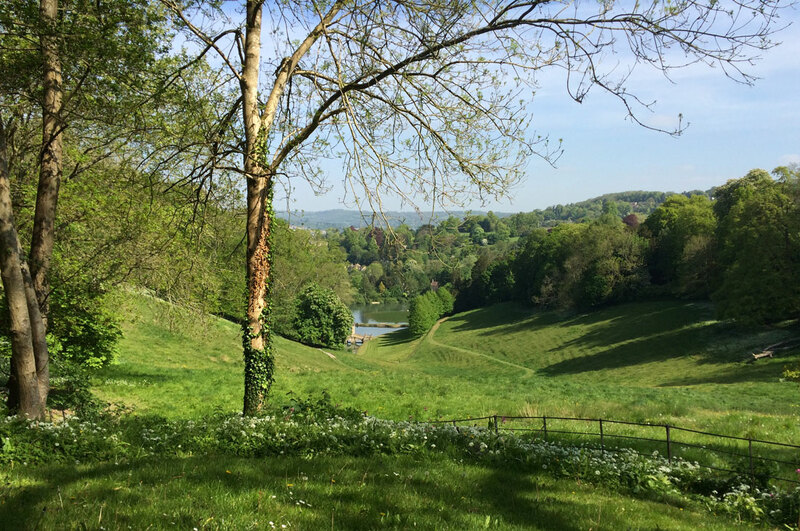 We look forward to welcoming Prior Park back to Silent Space when the work has been completed. For opening times please check the garden's website.